I tend to be wary of books, particularly fiction, by people who have achieved fame in some other form. I am particularly wary of books by actors – I’ve read too many that seems to have been sold on the actor’s name and not the quality of the work. And I really didn’t want this one to be bad because, well, it’s Tom Hanks and I like Tom Hanks! But I also really wanted to read this because, well, it’s Tom Hanks! Fortunately, this shows that Tom Hanks CAN write and deserves to be published. This is a collection of short stories (and I’ve written before how much I enjoy the short story form). The thinking in the publishing industry, however, is that short stories don’t sell books. That may be true, but celebrities do! Hanks’ work here is a throwback to the days when all writers wrote either in long-hand or on a typewriter. The stories themselves have a sense of long ago, as if Hanks is recalling days when he first really enjoyed reading. The settings, the style, even the tone of the stories remind me of literature of the 1970’s. One of my favorites here was “Alan Bean Plus Four.” This features a group of friends – Anna, Steve, MDash, and a narrator who is hard not to picture as Tom Hanks – that remind me so much of my own group of friends from this period … though we did not go into space in our own, homemade rocket ship (but if we had, we just might have named it the Alan Bean). “Who’s Who” was another favorite. Here it is 1978 and a young actress who was having a successful-if-not-quite-satisfying career in Arizona has moved to the Big Apple to make it big. But she’s still sleeping on the couch of a friend and pushing the limits of the kind offer to stay until she gets settled. But finding work, finding affordable housing … it’s a lot harder than Sue Gliebe anticipated. One can’t help feeling as though Hanks writes from experience here, possibly remembering his early days as an actor. Once again we get the impression that this is personal – a memory that Hanks has. If it is, Hanks does a masterful job recalling the memory and sharing it. If not, it’s even more impressive. Most short story collections show a range of work – some that really reach a reader and some that just don’t click. That holds true here, but even at his worst, Tom Hanks is a really fine writer. At his best, you will be drawn in and left wanting to read more. Looking for a good book? 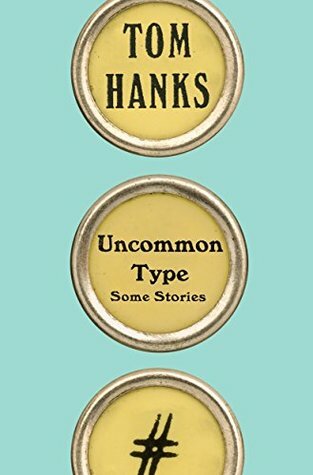 You’ll want to read Uncommon Type because it’s a collection of short stories by the actor Tom Hanks, but you’ll enjoy them because Tom Hanks the writer is very, very good.